16 cm tall (6 inches). 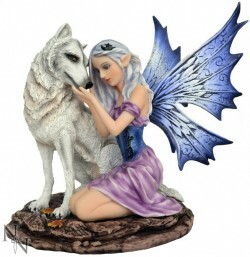 Beautifully detailed fairy wearing a purple dress with blue wings kneeling beside her companion wolf. An eye-catching and weighty Fairy statue with great detail and design. Solid figurine. Arrives within protective polystyrene casing. Cast from solid resin for a stone statue look and feel.